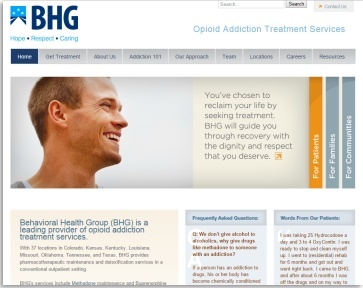 Behavioral Health Group (BHG) is a leading opioid addiction treatment services provider in the United States with 36 clinics spanning eight U.S. states. They provide pharmacotherapeutic maintenance and detoxification services in an outpatient setting. The organization offers patient-centered treatment which utilizes medication-assistance including methadone and buprenorphine (found in the popular medication: Suboxone). BHG strive to help patients restore, maintain, and enhance their personal well-being and to achieve an optimal level of functioning. Their philosophy includes a commitment to treating all patients with Hope, Respect, and Caring. The organization’s core values encompass: Character, Enthusiasm, Compassion, Teamwork, and Perseverance. As a group of JCAHO accredited treatment facilities (via the Joint Commission on Accreditation of Healthcare Facilities), BHG deliver a quality of care that is rooted in evidence-based, best treatment practices.